Is Subway Really A Place to “Eat Fresh”? Whenever I bring up Subway, there is a serious debate here on Snack Girl. I have been watching the NFL playoffs and I feel like the whole thing is a big commercial for Subway and Bud Lite. Subway hired all these winter Olympians to promote the food and Bud Lite has this crazy commercial with mountain climbers. 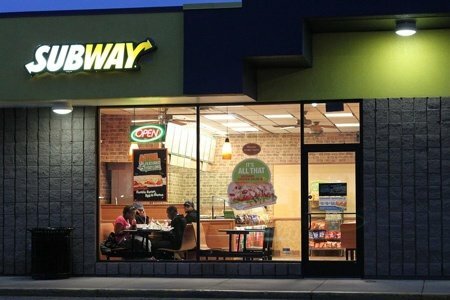 Subway is the largest restaurant company in the WORLD. I know that it is the largest one in my world. My tiny town of 30,000 boasts three Subways and ZERO McDonald’s. Really. Amherst also has three Dunkin’ Donuts and recently added a food cart serving falafel. If I want a Subway sandwich, I can have one within a three minute drive of almost anywhere in the town (that is how small it is). Now that we agree that you can’t avoid passing the place, should you eat there? I am going to give you my list of pro’s and con’s and hope that you can add your own. There are no fries to tempt you. Compared to other fast food venues it is a garden of Eden with the vegetable choices at your disposal. The bread does not taste good (to me) and has some questionable ingredients. The sodium content of most sandwiches is too high. Cookies, soda, and chips are everywhere (not fresh or healthy). Jared lost a lot of weight by eating there but I bet he didn’t order the Philly cheesesteak. I think Subway is a better choice than most but you have to order carefully. I like the 6-inch “Veggie Delight” and I don’t add mayo. I add an Italian dressing and call it a salad sandwich and it works out to only 280 mg of sodium and about 250 calories. I drink water (because I am cheap) and I don’t order the cookies or the chips. Did I do better than a Big Mac? Absolutely! I ate spinach, onions, peppers, mushrooms, lettuce, tomatoes, and cucumbers instead of 2 beef patties, cheese, and special sauce. Did I like it as much as a Big Mac? No, I did not. I have stopped eating Big Macs because they make my stomach hurt but what I remember is better than the Veggie Delight. What do you think of Subway? Do you eat there? What do you order? We eat there rarely. Not a fan. I would rather cook at home or take food in the car from home :) A much better alternative! If I have to eat fast food, I always choose Subway. It is a far better alternative to the other choices. I usually cook and always pack my lunch. Fast food was my addiction. I'm 2 yrs free from it. Subway is also good since it is not as convenient as the other places - no drive thru, made to order means it takes more time and I'm more likely to plan a meal from home. Last time I had Subway, picked up a Turkey sub while at lunch on jury duty. It tasted like I was eating a cardboard sandwich (really!). If I'm going to eat calories, I want it to be tasty so ended up throwing most of it away in trash can outside courthouse. A little annoyed because I was hungry. I'm sure the philly cheese would have tasted better. Jared probably lost weight out of boredom! I eat there maybe 2 times a year. Don't understand why it is promoted by people who are trying to lose weight (Jared commercials) as far as I know lunch meat of ANY kind is not good for (too much salt and lots of other stuff). Even though Jared lost that weight doesn't mean that eating all the lunch meat didn't cause other issues for him. When I eat there I am bloated for about 2 days. I only get their egg white breakfast wrap. Except I don't est the brea. Just egg white, spinach and tomatoes. Only food I will order there. Go for the Honey Oat bread... a few more calories but with five grams of fiber per 6", it will help soak up some of the fat. They recently added a SECOND Subway to my workplace campus. For me, though, it beats the other options in the food court, so I tend to eat there once a week or so, when I don't have the time or patience to pack my own lunch. You can always order any of their Subs as a salad, selecting whatever "fillings" and dressing that you want - and you get a nice, big, healthy and yes, fresh, salad. This is what I usually do, but when I do order a sandwich, I only eat half the bread - I take off the top, and eat the fillings on the bottom. Their 9-grain wheat is pretty good, the Subway roll is just TOO MUCH BREAD. I've been meaning to try their flatbread, but haven't yet.I think you could do much worse than Subway for a quick, healthy lunch. (but of course, you could do better just by brown-bagging from home). I believe Subway is as bad as the other fast food restaurants for the mere fact that it promotes itself as healthy when its anything but healthy. I don't eat any fast food as a rule but did have no alternative to eat there last fall when I was in Western Mass. I should have just eaten one of the apples we picked by I was overruled by the group (teens) I was with. The taste of the sandwich I had was awful! I can't even stand the smell whenever I walk into a Subway restaurant. They may have a few "fresh" vegetables but those are limited and usually look old. Everything else is completely processed and so bad for you. Breads and whole grains are another misconception of eating healthy as they cause bloating and all sorts of other problems. Thankfully we don't have any fast food establishments in the town that I live in on Cape Cod. I actually had subway last night. I have the other half of lunch today. I like the wheat bread or I just get the salad bowl. It was a quick fix after my son's basketball game. I use load on the veggies and use mustard, vinegar on salad. Nothing creamy or white. I get cheese every now and then. Its better then a deli sub. I do so little fast food but I love the veggie delight at Subway. It's the only thing I order. The problem I find is I'm usually in a hurry and can't wait in line, so i rarely eat there if I'm rushed. Bread is a trigger food for me so I try to limit it. My favorite rushed food is sushi from Wegmans, the selection is amazing and fresh. I just keep Lara/Luna bars in my purse so I keep the need for fast food away. I just LOVE LOVE LOVE my Veggie Delights! I've been eating them almost every Friday for lunch for over 1 year. I have the 6" flatbread with 1 slice of provolone cheese and ALL veggies, even the hot peppers, with a little light mayo and their red wine vinegar. I could eat these every day, but by having them only on Friday starts my weekends out right. I'm now a lifetime member at WW, lost---no got rid of, because I don't want to find the pounds again, over 60 lbs.!!! Subway is the ONLY fast food I eat. Thank you for letting me share. I get a salad with spinach, iceberg lettuce, tomatoes, banana peppers, cucumbers, onions,green peppers, vinegar and black pepper. Will also get small bag of apples and water. For the most part, pretty healthy to me, and usually all for under 10 bucks. I don't eat at Subway, but friends who do tell me their sandwiches are mostly lettuce with little meat and terrible bread. Since I live in the Philadelphia area, we have many choices of delicious hoagies and cheesesteaks, If I am going to splurge on them, I order from a deli that I know has good bread and good meat. protein. Not to mention that contrary to the sandwiches from Subway that we all see on that famous tv weight loss show, they are extremely stingy with their ingredients. So, in effect I'm eating something that won't keep me full for very long, has little taste and isn't satisfying. If I'm feeling the need for an indulgent sandwich I much prefer a hummus wrap at Pita Pit, adding chickpeas to my DiBellas sub or cobbling something together at Wegmans. At least I feel as though I've eaten something. The bread usually doesn't taste fresh. I always get Veggies and Cheese or Chopped Salads. Our usual choices when in a hurry are Chick-fiL-a, Subway or once in a while Wendy's. My daughter worked there, and everything is not fresh, it's frozen. If you're going veggie, you need to get mustard, not Italian dressing. Mustard has no fat, and will further make the option less hazardous. I eat at subway about 4 or 5 times out of the month. I buy the Black forest ham no cheese all vegys, spiced mustard, and I only eat the bottom of the bread. I like them for the calories and I do think they taste as good as possible. It's all in the choice you make. I love the 6 in chicken breast on the garlic bread with lettuce, onions & black olives with a dash of oil & vinegar & oregano on top. It is delicious & filling. Days I'm really hungry & have the calories to spare I do a foot long veggie delight with all the veggies, oil, vinegar & oregano. Everyone at work drools because it smells so good. They have baked chips as well as regular, all in the choice. Subway is tg e only fast food I eat. My daughter lost 35 lbs by only eating Subway for fast food so yes you can lose weight as well as Jared did! Make the right choices! We now have 4 Subways in our town of roughly 30K. I can't remember the last time I ate there. I just don't like the sandwiches very well. Like you, I don't really like the bread -- and I love bread normally. The deli meats also don't taste as good to me as from other places. I may be judging it unfairly, though, because I used to live in a town with a really bad Subway (according to my parents who noticed a huge difference compared to the one in their town). I'd much rather go to Jersey Mike's or Publix. If I order a 7 inch turkey sub without cheese, I don't consider that a horrible meal out, even with the treat of a little mayo. Of course, both places consider a 7 inch sub a "half" sub. Tip: When ordering a sandwich, ask them to "hollow out" the bread. It saves calories wasted on unhealthy carbs and lessens the overwhelming taste of the bread. I was working with a volunteer rescue group and Subway was kind enough to give us ice for our coolers (which we appreciated). We entered through the back door and what I saw made me realize that the word "fresh" isn't very accurate. There were buckets of chopped/sliced veggies that had obviously been shipped in. How long ago? I don't know, but I wouldn't call them "fresh" by any stretch of the imagination. However...we did appreciate the ice. Jared lost weight not only eating at Subway but he walked to and from the Subway. He was not only eating less calories but he was exercising too. I order the chicken breast and double the meat. At least the chicken breast looks like a regular piece of chicken. My reference book, BD Getting Started Fast Food Guide, lists the 6" Veggie Delite as having 520 mg of sodium without added dressing. A two-ounce portion of Italian fat-free dressing is listed at 720 mg sodium. As a registered dietitian and Certified Diabetes Educator, I recommend limiting sodium to 600 mg per meal, 200 mg per snack. These guidelines allow for a total of <2400 mg daily, the recommended limit for most healthy people. Those over age 50 and those with hypertension, heart disease, and other health issues are advised to limit sodium to 1500 mg daily. I taught nutrition classes for years, and I used Subway menus as a teaching tool. The Veggie Delite is acceptable in terms of calories, carbs, and fat, but the sodium is too high. Sadly, this is usually the case with virtually all restaurant foods. I used to eat Subway faithfully until I read an article that stated their sandwiches weren't any better than McDonald's. Also, I'm hesitant to eat anything from there when you can get a foot of sandwich for $5. The ingredients must be crap. Their bread is gross! Used to be much better. As someone who managed a Subway for years I can tell you it is anything but fresh! I will say if I were to eat fast food I would probably do Subway but stay away from the bread, cheese, and meats! I prefer not to do fast food myself. I just can't believe that anyone can NOT like Subway! Not only is it inexpensive, especially with coupons, but for weight watchers, the nutrition stats are clearly stated. Sure, it has Philly steak, but it has some very WW friendly options. Personally, I love love LOVE the flatbread, (I leave the cheese off, so it's a good trade-off), black forest ham with lettuce, olives, peppers, pickles, and a drizzle of lite mayo and sweet onion sauce. Mmmmm, GOOD! I also love Subway as my fast-food of choice. Certainly I can make something healthier in my own kitchen, but if I'm traveling, that's not an option. I love their chicken noodle soup as well, and the sodium is high, but comparable to most restaurant or canned versions, so not surprising. My kids love the healthy sandwiches, and baked chips are certainly a good alternative to french fries. As to the cookies- I think that's no big deal. All things in moderation, and every once in a while, the kids get a treat after their meal. SUBWAY in comparison to other "fast food" is a good choice. I prefer BLIMPIE'S. The bread is better I think and for some reason the sandwich is better although it is about the same thing as SUBWAY. In my neighborhood, the people at BLIMPIE'S are much nicer too. That makes a big difference to where I spend my money, even $5.00. Ick! ALL processed! We have 3 in our modest sized town. 2 free-standing and one in the Wally Marts. Even ordering the Veggie Delight, I used to have to tell them "More please?" I mean, come ON! THREE measly, pitiful spinach leaves? I used to eat there quite a lot, but since I've started eating clean, it's off the radar! I'd much rather a GOOD sub from Submarine House (a local institution) Those can take days to eat! Not all Subway meat is processed deli meat. They even offer vegetarian sandwiches that I have enjoyed from time to time. Sure beats most of the fast food places in our town, most of which have made me ill in the past. That has not happened to me at Subway. We like them and I like that I can get a lot of veggies on my sandwich that I cannot get at other restaurants. Our town is small and there are few choices for me to get unchained from the stove! We have only one McD's, one Taco Bell (too much salt), our Wendy's just closed up (? ), Taco Bueno (Ick), Taco Casa (better), two Sonic and one Dairy Queen. Everything else is 2 hours away in any direction. Because the weather has been colder, I have started baking breads and made "no knead" pizza the other night. Homemade pizza is the best fast food. I let the dough rise overnight and by the time supper rolls around, the dough is ready to be topped with fresh ingredients. It takes about 20 minutes to bake at 550 degrees. So in about 30 minutes or less, we have a delicious "fast food" meal. Hubby is even considering building a pizza oven for us in the back for the spring and summer days when we don't want to heat up the house. With just a little wood, we can make stews, cookies, bread, pizza, soups, and roasted veggies in the pizza oven. Pizza ovens can get over 800 dgrees and cook a pizza in two minutes! Yes! Check out the You Tube videos and see it done. I would almost always rather eat at home and my cooking, so I am told, is the best in town! Subway is ok compared to other fast food. We have them toast the multigrain footlong bread, then they rip out the "doughy" part. Then there remains a toasty shell that has lots of room for all,the veggies. We fill it up BIG, no processed meats, add a shmear of hummus at home. No time consuming chopping and dicing. Love it! I only eat out when I'm traveling or pressed for time! Subway is my favorite - toasted ft. long roast chicken, pepper jack or swiss cheese, spinach, tomatoes, roasted peppers,black olives, honey mustard,lite chips, free cookie w/coupon, fresh fruit which I usually carry with me,and free tap water. I buy and use $50 subway gift cards at Giant Eagle (gets you 10 cents off per gallon of gas which you can accumulate up to $4 off/gal.) in Pittsburgh, PA. Other choices - Chipolte, Moes, Quzinos, Blimpie, McD. Being retired, I travel @ 2wice/month - 30,000 miles, 3 cruises, 25,000 air miles last year. I also cycle 5,000 miles/yr. and ski 25 - 40 days, swim, weights, etc. I need lots of food that I enjoy. I'm conscious and careful about nutrition eating 3 - 4 meals daily, but I also drink beer and snack nightly, but it doesn't rule my life! Retired 15 years, I'm 68YOA, 6'3", 180# and enjoying life,food,and drink! As for fast food - we all have to die of something! Getting foreign objects in your food can happen anywhere. They recently built a beautiful Chinese restaurant in our town with huge crystal chandeliers and a painted ceiling over the buffet and apparently spared no expense. Well, one day hubby got something, we are not sure what it was, but it looked like a dust ball the size of a meatball. They did not even offer to pick up the check. He wants to go back, go figure. Not me, even though I used to go the Mongolian grill they have. SO, like I said, it can happen anywhere even the "finest" restaurants, but I don't blame anyone for not going back if they have had a bad experience. However, at Subway, they make the sandwich right in front of you so I am not sure how anything foreign can end up in the sandwich. That leaves me baffled. It's interesting to read all the comments and find I've identified with most of them during sometime in my life. Now, for the past 10-15 yrs I became a no-fast food convert because I could [more time, more knowledge, more experience, etc.]. Never was a huge fan of FF but I did partake occasionally. Nowadays, I research everything I eat, preach alot about better choices, organic, etc. [Yesterday, for example, I made this fabulous maple glazed tofu ''ham'', for the week; I'm including the recipe here if anyone is interested. (http://veggiesue.blogspot.com/2013/01/maple-glazed-tofu-ham.html ). I added 1/2 tsp. ground cloves, used canned organic crushed pineapple, OMG! Insanely good sandwich with mustard and sauerkraut on Alvarado St sprouted bread! Today I'm cutting up a slice on my salad, my daughter stopped by and loved it too]. Food Babe is a great resource, Snack Girl keeps us sharing our food wisdom, Michael Pollan isanother favorite of mine. My best choice in the Grab 'N Go category is a piece of fruit and if I forget to bring it, can find fruit usually even at convenience stores. Or I just work up a good appetite and skip a meal, think of it as a fast, or a penalty. LOL! Here's a good review of Subway's offerings and a short interview with Michael Pollan. Cured my occasional FF forays! Happy food journey 2014!! I'm on the road a lot because of my job ... so don't have a lot of choice sometimes for lunch. When possible, I'll head to a Subway or Mr. Sub because I know it's the healthiest of the other options. I posted this on FB as well but I try to avoid it at all costs ever since I found out they put an ingredient found in fertilizer in their bread to make it "appear brown" gross. You think your town is small? I live in a town of 2,000!! We have subway and McDonalds, and pizza hut. I love subway, but really don't do much of any of them. mostly eat at home, and it is homemade! oh and P.S. (from the link another reader provided above): "The 9 grain wheat bread might look and smell freshly baked but it contains close to 50 ingredients including refined flours, dough conditioners, hidden MSG, refined sugars, etc. Could bread this processed ever be real food? Certainly not, when it includes a chemical ingredient called azodicarbonamide, which is banned as a food additive in the U.K., Europe, and Australia, and if you get caught using it in Singapore you can get up to 15 years in prison and be fined $450,000. Azodicarbonamide is more commonly used in the production of foamed plastics, however, it is allowed in the United States as a food additive, a flour bleaching agent, and a dough conditioner that improves elasticity of bread. The U.K. has recognized this ingredient as a potential cause of asthma if inhaled, and advises against its use in people who have sensitivity to food dye allergies and other common allergies in food, because azodicarbonamide can exacerbate the symptoms. Let’s not forget it only takes 4 or 5 simple ingredients to make REAL whole-wheat bread including flour, yeast, salt, water, and maybe honey." I feel like I was raised with subway, especially during the sports seasons since it was right in between my high school and home. But then I got tired of it.... needless to say once my college campus got one I began choosing it again simply because it was better than the other food choices. I definitely like the convenience of it, and the fact I can grab my lunch to go if I haven't stocked up on groceries. Its smart to remember what you're eating but I don't dislike it as much as I used to. I eat at Subway quite often. I have been a vegetarian for a very long time and it is my go to place when we are on the road or even at home where I know I can get a veggie sub with cheese and it will be just what I ordered. It is not as tasty as the veggie subs I request at the sub and pizza places we go to but it is less calories and fat then those. My family likes it as well but we do not order the meatball or others that are high in calories and fat. Turkey and ham are the two my kids like. I saw Jared on one of the NFL shows and he said said he ate the turkey and veggie when he lost the weight. Some subways offer guacamole as a condiment on sandwiches. Not all stores. I went to the subway on my campus and asked for guacamole and the lady asked me if that was the green stuff? Sometimes I'll get the bread scooped out all the veggies avocado and hot sauce. No cheese meat mayo dressings. Without the bread and just all those veggies in a bowl with guac is really the best you can do at a fast food place. Love one comment about bringing it home and adding your own hummus! Also - imacrazymomof4- watch out for wegmans sushi! Some of those ingredients are really questionable! I find there is a funky smell in the Subways. If you eat in the restaurant, you have that smell on you for the day. Meh. I eat Subway as a last resort - we're lucky because we're vegetarian, and the one near us offers avocado year-round, so with that added to a veggie delight, it's a half-decent option. I wish they would just offer a simple whole wheat wrap instead of that horrible flatbread or a stupid sub roll. There's a place called "Pita Pit" that is something like Subway but with pita and it has whole wheat and a million better toppings (including falafel and hummus - OMG). I keep wishing for those to get as big as subway - now THAT is good fast food!! I had no idea about the bad ingredients in the bread. This may change my mind about going to Subway again. Thank you for the information. My family NEVER eats at Subway. The food is tasteless. I would much rather spend 1/2 more to go home and eat food that we know is not laden with stuff and tastes better. I always get either flatbread (the only bread without azodicarbonamide) or a salad. I remember that roast beef was the only meat with clean ingredients, but I've forgotten the details. I'm assuming preservatives and soy oil. Either way, it's cleaner than most fast food, so I get it with lots of veggies and vinegar in a pinch (ok and admittedly sometimes the sriracha sauce; I'm guessing it's good I never found the ingredients list for that, hehe). Because of my work I go to Walmart alot (Subway inside) so sometimes (though rarely) like Cindy I will get the egg white, spinach and tomato flatbread and toss the bread. Another option I will get the grilled chicken at Wendy's and ask that they skip the bread and add another piece of lettuce, which they don't have a problem doing. A little messy, but that is what napkins are for. Barb L. thanks for the post of Maple Glazed Tofu Ham,can't wait to try that. Sounds good. I have a subway across from work and we have a department agreement that lunch is a free pass on Fridays. With the massive amount of local, health mom and pops around us in Los Angeles, when anyone mentions subway as an option, it is said with a scrunched noses and a cringe. Subway has no flavor or appeal. The wheat bread has more sugar than the white and the meat looks questionable. I would love to love a veggie delight but I can't pay $5 for vegetables I should have brought from home. I do eat at subway and I enjoy it. They always let me load up my sub with lots of vegetables and with the toasted bread things taste pretty good. I like the egg white sandwiches and the spinach salad too. I love Subway. It is great is we are traveling and don't want to eat other fast food or restaurant food. I get that there are a lot of processed meats, cheeses etc there, but as far as getting something fast and healthy in the fast food world, it is definitely the best. I will say that I have lost about 80 lbs and had a 6 inch turkey sub at leave once a week for 10 months. I also did not order the cookie, but did have diet soda and baked chips. It works well with my crazy schedule and is a good choice for me. Subway is pretty good, as fast food goes. But if I can find one, I can an eye out for soup and stew stands. There's a really filling and nutritious meal that's warm, cheap, and normally run by a single entrepreneur who really needs my support! which is gluten free & delicious. Just my 2 cents. When traveling, we always look for a Panera bread. The food is always fresh and is accommodating to our whole family with 2 vegetarians, an always calorie conscious mom, and a dad who loves food! First, I gotta say, I never (really, never) eat fast food. On rare occasion when I must resort to take out, I actually prefer Subway to most other options. I stick to the basics - whole wheat 6-inch bun with veggies galore. I don't 'do' mayo, but choose mustard. My secret - I always get the sandwich toasted (it really does make a difference!). I'm always amazed by the calorie count of their sandwiches and being a Weight Watcher, find it hard to believe that the dinner roll I sometimes buy at the grocery in-store bakery is more points than my entire Subway sandwich! love my sub filled with all the goodies i dont use at home. 99% of the time crisp and fresh. bread just baked and no fryer grease hanging on the air. also notice customers are a healthy crowd. I eat there occasionally but the decline over the years in quality and quantity is very obvious. My real peeve is in watching the Biggest Loser program tout it like it's great for the obese and maybe it is a better choice but it's not for DIABETICS. Their bread will send the blood sugars soaring even over other breads. Moderation and care with your monitoring is key. I get a six-inch sub, my favorite being roasted chicken, with veggies. I take mustard instead of mayo and hold the cheese. It's filling and it's around 250 calories. I cook most of my meals, but quite often go to a restaurant, and Subway is a pretty good choice. I don't find anything wrong with the bread. Well, our town is more than 2000 people but they are spread out for several miles in each direction. I once lived in Lincoln, MT at the time a town of 200. It was paradise and no fast food anywhere. We had a donut/sandwich shop. We had the best donuts I have ever had. We had a lady come in and make them and she made a chocolate icing that was the best I have ever had and haven't had since. We had only a couple restaurants that everyone in town used to go to. It was a great place to live. I am sure it has changed a lot these days. I was actually surprised at how good my veggie sandwich was the first time I ordered one. My kids like to go there because they get to have a rare ICEE, but I do agree that their bread could taste better. Google search "Food Babe Subway" for a full review of subway. Including their rolls and what is in them. Not good at all. Interesting article about a survey of people at fast food restaurants estimating the calorie count of foods they just ate. I have read before that people look at the SW poster of the 6" sub of 300 cal on the wall, not realizing the fine print shows just lettus, tomatoes, mustard, no high fat toppings or oils, then add extra cheese& meat, mayo and crank the fats & calories. I think this is why the people leaving SW were the worst at over estimating calories.I eat there when I don't want to cook, but watch the toppings! I used to work at Subway-don't worry there are not absolute horror stories, but subway is not that fresh. Obviously it's franchised so each subway is run differently but we do all order the same product from the same companies. Most of our "prepping" would be done the night before, not the day of. Which is certainly not horrible, but you might as well make yourself a snack at home and leave it in the fridge then eat it the next day, same difference, not very fresh. The only things we made day of were bread and cookies. And almost all the veggies come from bags. I still like to eat subway but very rarely (I'm more of a port of subs girl cause I can get pastrami). All in all you have to keep in mind Subway is still fast food and just like Mcdonalds has their healthy and unhealthy choices so does this one. Opps! I meant to say people leaving SW were the worst at underestimating their calories. Oh! I forgot to add. No, none of the meat is fresh. It all comes in little plastic packages, and please dear lord never order the chicken breasts or meatballs or soup, cause the way it's made just disgusts me. That's the only horror story. When I was in university (way way back, I graduated in 1993), I used to work for Subways. My thoughts on their food? The veggies are shipped in fresh, we had to cut it ourselves with one of those meat slicers. The cold cuts, the same type as when you buy it from the grocery store. We received it in those big ball lumps and so had to slice it ourselves. Basically, we're talking processed meat. The bread are frozen sticks which thaw and then rise in those specialty ovens. Oh, I almost forgot. The meatballs. They were already cooked and frozen in huge bagfuls. We nuked them and put sauce on them. The cheese, processed as well as real. Depends on what you ask for. That was then, not sure how it is now. Overall, I'd say it's about as healthy as you make as home when you buy bread and cold-cuts from the supermarket. Which is to say not very healthy at all. It's like saying I still think it's healthier than KFC and Mickey D's, but I'd like to see more fast food outlets where you can get a sliced avocado, egg, eggplant, grilled tomato sandwich on...warmed foccacio. And iced green tea. Honey instead of sugar. This is sad I remember (years and years ago) when Subway used to be good and had quality ingredients! They succumbed to the competition and now promote more unhealthy items. However, I still do agree if you have to pick lesser of evils of the FF world I would pick Subway! I only eat there if I forget to bring my lunch for work. Its better than McDonald's. Subway has good intentions, but my favourite healthy, fun and fabulous fast food option BY FAR -- is PITA PIT . . . they have an awesome selection of healthy ingredient options, as well as a few for the less virtuous of us :) One of the things I love about eating there, is that I can select EXACTLY which ingredients (of many) that I want in my Pita -- my kids LOVE it, and when I get their pita tray for meetings at work -- it's a total hit. My girlfriend, who avoids gluten loves the fact that she can have a pita in a bowl -- makes an awesome 'make your own' salad option -- can't say enough good things about these guys -- second to none in my opinion. Think you have a better selection in America - I live in the UK and we don't have a lot of the salad/filling options that you all have. Admittedly, I do usually get an Italian BMT on Italian bread with lettuce and sweetcorn so not the healthiest choice. I never get crisps though and will only occasionally get a cookie. I love subway - cheap, quick and one of the healthiest places in our local shopping centre - my other choices would basically be McDonalds, Dominoes Pizza or Taco Bell. @Bill- You are so right about "rabbit food" not solving the weight problem. Carbs and processed foods as well as overeating are the elements making people overweight or obese. Veggies and fruits are an important part of a diet with antioxidants, phytonutrients, vitamins and minerals that they provide. If you are an adherent of Paleo, Bill, I have to say I am adamantly against fad diets. We do not live in the Stone Age anymore. Yes, genetics have an important role in our health but I believe, as we have many choices of food today, that we can avert and/or delay or prevent those physiological negatives that plagued our parents or grandparents, etc. It takes resolve, knowledge and discipline. My grandmother did not exercise nor did she have a particularly active life from about the age of 50 and she lived to 98. She ate a balanced diet and raised Black Angus cattle earlier in life. She drank one alcoholic drink in the evening and did not smoke. She was not obese and mostly in good health all her life. So I think it depends on how much exercise we find necessary in relation to what we eat and what our lifestyles are. People who have exercised regularly and had so-called healthy diets have dropped dead on the spot for no apparent reason. I do think it is important to have a balanced diet without a lot of processed foods and not have an exercise obsession. Changing my diet and food combination worked for me more than exercise. I used to work out at the gym 2 hours a day but never lost one pound. My son prefers Subway over Burger King or McDonald's and it's much closer to our house - a good thing. But I think they really cheap out on what looks like processed deli meats - and of course my son refuses anything that looks like a vegetable.